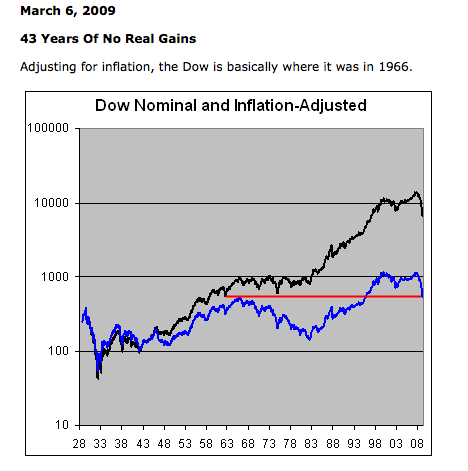 The S&P 500 and Dow Jones Industrial Average bottomed out at around 666 and 6500 respectively on Friday, March 6th of 2009. Just for fun, and because it’s been too hot to go outdoors, I thought I’d take a look back at what my favorite financial bloggers were talking about as we stared into the abyss that week. 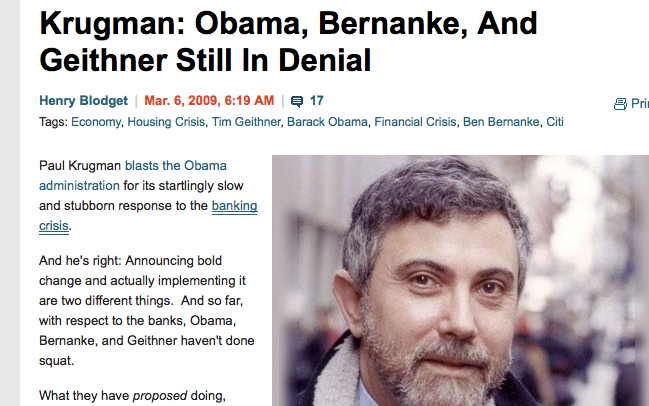 Clusterstock‘s Henry Blodget was talking about Krugman‘s op-ed from that morning blasting Obama, Geithner and Bernanke for dragging their feet in terms of stopping the bleeding. 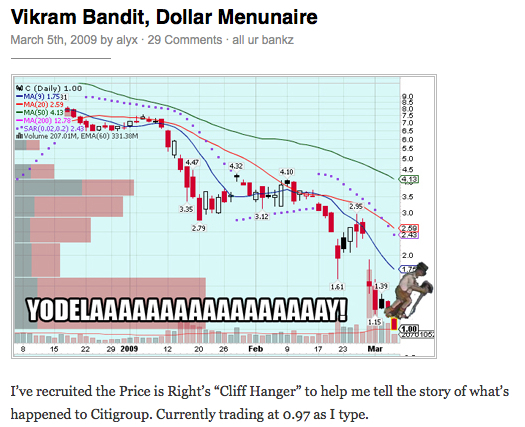 Abnormal Returns probably had the most appropriately titled post that day. 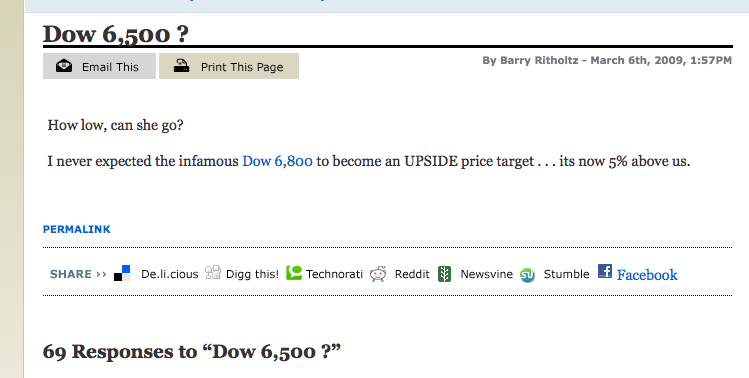 The Big Picture‘s Barry Ritholtz was amazed that his (incredibly accurate) downside target of 6800 for the Dow was actually lookin’ like an upside target! The Pragmatic Capitalist discussed whether or not then-Merrill Lynch analyst David Rosenberg thought that 666 was the bottom a few days later (he didn’t think so). Jay from Market Folly caught us up on the latest Jimmy Rogers intel. Market-Ticker’s Karl Denninger talked about how nothing could be fixed until “The Bezzle” was addressed (meaning the money that was allowed to have been embezzled from us as a nation by lax or complicit oversight). Calculated Risk picked up on the LLoyd’s of London bailout announcement…and the market’s bounce. 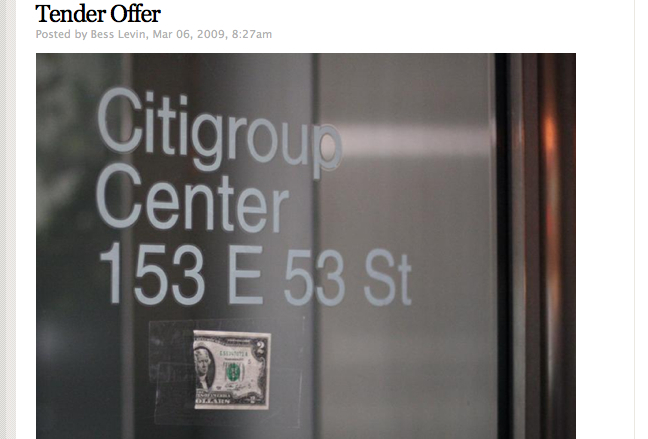 Crossing Wall Street‘s Eddy Elfenbein showed us a startlingly ugly statistic. 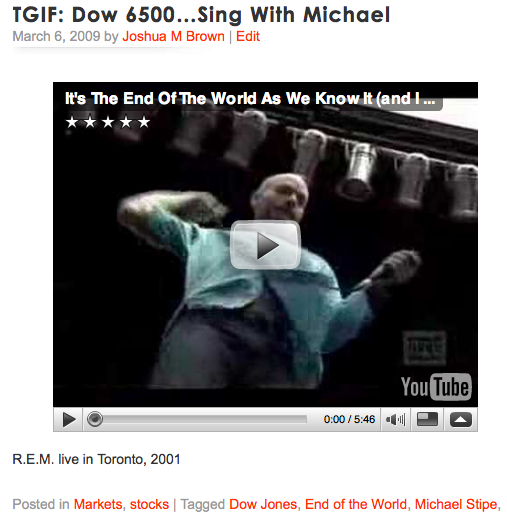 Yes, I really did post an R.E.M. video on my way out that day (dork). Instead, I should’ve been buying everything in sight. Oh well…eventually I caught on that the lows were in. We’ve come a long way since those dark days, let’s hope we never have to revisit them. You are forgiven for confusing LLoyds of London with Lloyds TSB. Spending the weekend in curled up ball, realizing I am not a favorite blog.